The tomato plant that I have in my garden is full of tomatoes. I can’t even begin to tell you how exciting it is to have home grown tomatoes!!! The other day I harvested a good few which had turned deep red along with some Persian Basil that I also have. It was a hot day here in Los Angeles and all I could think about was making a fresh tomato salad. Italians may have their Caprese, but we Persians now have our own version!!! 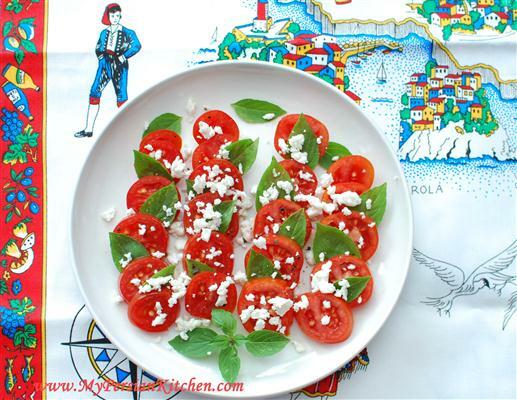 The common factor is the fact that both dishes have tomatoes, basil, and cheese. However, for the Persian version we have Persian Basil, also known as Lemon or Holy Basil, and Feta Cheese! I don’t really need to tell you the amount of ingredients because you can make this as big or small as you like. 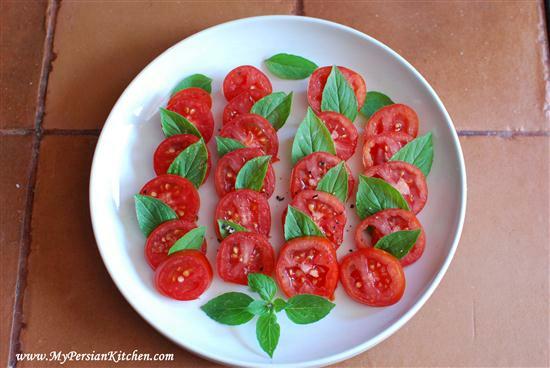 Cut tomatoes in rounds and arrange on a plate. 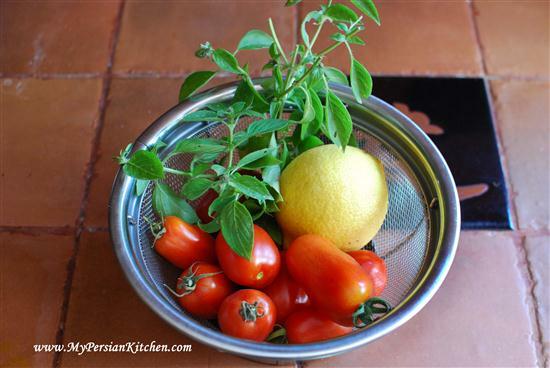 Place a basil leaf between each tomato. Sprinkle some freshly ground pepper. Sprinkle as much crumbled feta cheese as you like on top. This is a perfect salad to have in its own, served as a side dish along with chicken or meat, or even as an appetizer! I hope you will enjoy it as much as I did!!! This is such a pretty salad. I like the difference here from caprese salad. I will try it this weekend! Delicious salad. We love Caprese too, very much. It is a summer time staple for us in the heat and busy days. We use Holy Basil already, which growing just out of the door is a gift from God! I have enjoyed it with Feta as well. I like it with a small amount of balsamic vinegar and olive oil to dip in, for guests, or sprinkled on just for me. Lovely food. Thank you very much for sharing your gorgeous food and culture. Can you help me were can i buy in Tehran fresh basil? 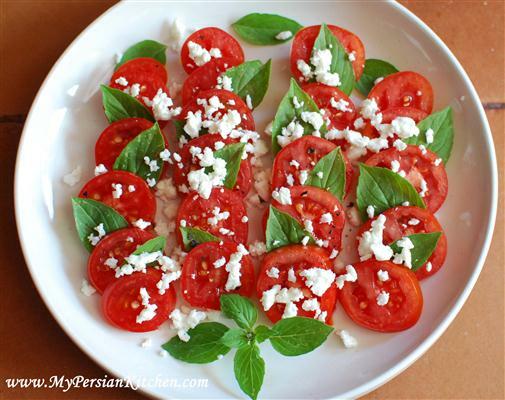 Eszter, you can buy fresh basil in tehran at most markets.